Gordon “Gordy” Yaeger (no relationship to Charles “Chuck” Yeager) was approached by Thunderbolt Aerosystems in early 2000, when problems with stability augmentation control of the TP-R1G2, was causing it to tip backwards upon takeoff. Mr. Yaeger had an extensive career at Bell Aerosystems, built upon a broad range of experiences in research, development, production evaluation and testing for the Aerospace and Military Transport Industry. He lent himself to help Nino Amarena’s Thunderpack design unabated --like during the days when he was a full active engineer at Bell-- and provided several insight on the original design criteria of the rocketbelt, which were not published nor spoken about for many years. This allowed Nino Amarena to delve with theories and implementations of techniques dreamed but untried during the days of the early design of the Small Rocket Lift Device, as the Bell rocketbelt project was code named. Yaeger obtained his engineering degrees at State University of New York at Buffalo and at the University of California at Los Angeles. Gordon Yaeger joined the Bell Aircraft Rocket Lab in April 1951 working on rockets designed to propel planes. In 1955 he traveled to Rogers AFB in the Mojave Desert near Lancaster, CA to work on the Bell X-2. His family joined him for 1 1/2 years. Back at Niagara Falls, he was assigned to work on the “Rascal” rocket missile at Holliman AFB in New Mexico and then was sent to Elgin AFB in Florida to assist in training of Air Force personnel from 1958-1959. Joined the Rocket Belt team in 1962 and was first to pilot the “Belt Model-B” in 1963. Offers started coming in for exhibitions at various places around the country and abroad. Bell assembled a traveling team and appeared for 10 weeks at the New York World’s Fair in 1964, 3 weeks at Disneyland in California for a Christmas show in 1964-65. Afterwards, they traveled to Cape Town (South Africa), Adelaide (Australia), Buenos Aires (Argentina), Rio de Janiero (Brazil), Mexico City, England, Paris, and numerous locations throughout the U.S. and Canada. 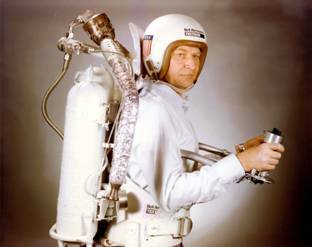 Gordon appeared in television programs like Gilligan’s Island and Lost in Space and the motion pictures Thunderball, with fellow rocketeer Bill Suitor doubling for Sean Connery’s James Bond character, and The Reluctant Astronaut, with Don Knotts. After the Rocket Belt team was dissolved in 1969, Gordon went on to work on the LACV, which was an amphibious air cushion vehicle. Gordon found himself working in the Quality Control department for the remainder of his career with Bell-Textron Systems and retired in 1987. 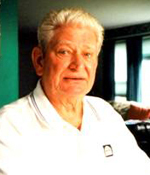 He passed away in January 2005 leaving his wife Nancy, 8 children, 15 grandchildren, and 6 great grandchildren.